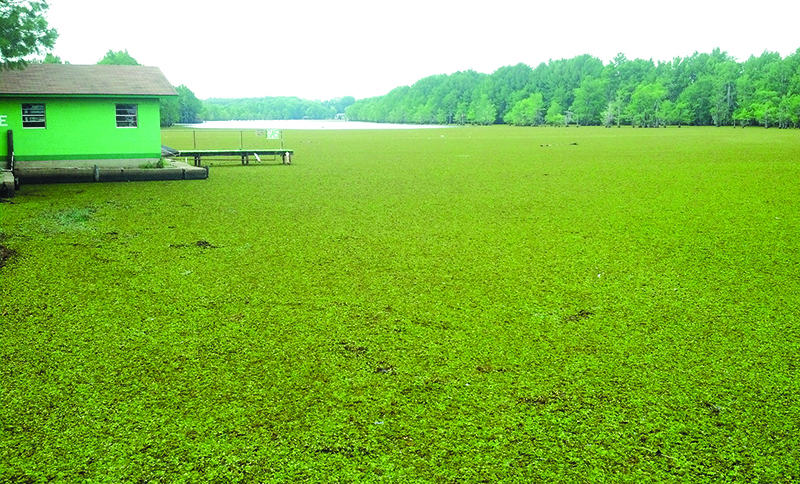 Crews contracted by the state Department of Wildlife and Fisheries (LDWF) have renewed the battle against giant salvinia on Lake Bistineau, but rain and high water isn’t making the task any easier. Jeff Sibley of the LDWF told members of the Bistineau Task Force that contractors have treated more than 600 acres of the lake to date, but have been hampered by the weather. “We probably could have covered more by now, but the crews can’t work when the weather is like it is now,” Sibley told the multi-parish task force members during their regular meeting at the Webster Parish courthouse. Sibley said the salvinia is beginning to form mats as new, secondary-stage plants begin to develop. And, he added, currents on the lake along with high water and prevailing winds shifts the mats from one area to another. Sibley said he plans to take an aerial look at the lake sometime in June, then conduct an evening public meeting to share with local residents what he has seen. “We’ll pick a date in the next week or two…probably try to call the meeting around the 22nd of June,” he said. Sibley said the department is sticking to its plan of treating the lake to maintain the level of coverage. He indicated some side benefits have been noticed that show the plan of treatment and controlling the lake’s water level is working. Sibley also explained why gates at the Lake Bistineau dam are not opened at times when Bayou Dorcheat is high and the lake level is rising. “Those gates are not flood control gates…they’re not designed for the lowering of the lake. Flood control gates drop from the top. If you raise the gates, you’re taking away a portion of the 1,200-foot spillway. It’s like having a big log jam on top and you’re piling up the water,” he said. Task force members also heard a presentation from Dr. Shinyou Li, director of Stephen F. Austin University’s National Center for Pharmaceutical Crops. According to Li, his team’s research on giant salvinia has produced some interesting results. As part of the research, Dr. Li’s team is also studying possible methods of eradicating or controlling the growth of giant salvinia. Bistineau Task Force members represent Bossier, Webster and Bienville parish police juries plus Saline, Dorcheat and Bodcau soil and water conservation districts. The panel was created in 2009 by the three police juries in cooperation with Trailblazer Resource Conservation and Development and the conservation districts.